Ellie has a background in Psychology research and the Early Years and previously worked as a reception teacher in a school in Ramsgate, Kent.She believes that the Foundation Stage plays a crucially important role in education as it shapes children’s attitudes to education and lays the foundation for them to achieve their potential. 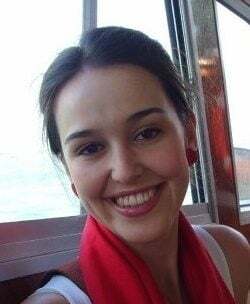 Ellie has worked alongside Teach First to develop the Early Years Programme and support programme participants, and, as a freelance researcher for Teach First and the Behavioural Insights Team. June is Gypsy Roma Traveller (GRT) history month. This presents a perfect opportunity for pupils to learn about a culture they often know little about and for the Gypsy, Roma and Traveller pupils to be given a chance to showcase and celebrate their culture. Our research last year on GRT pupils educational attainment and higher education progression highlighted that many teachers feel they lack knowledge of GRT groups themselves, and may therefore feel unable to teach this topic. So I’d like provide some helpful tips from GRT support groups, handy online resources and experts to help everyone make the most of GRT history month. GRT is not a single group: a number of groups fall under the umbrella. The typology from our King’s College London report is a good starting point for anyone who is unsure but is not an exhaustive list. Clearly, the fact that GRT covers a variety of groups and communities means we can’t learn about all of GRT culture in a single afternoon. It’s fine to pick a particular group or element of culture to look at but make sure you acknowledge that this doesn’t apply to every community included under the umbrella term. Teach the good with the bad. Frequently, teaching about the history of minorities focuses on tragedies, hardship or inequality faced by that group in the past (or present). When government ministers are asked about including GRT groups in the curriculum they often reference the compulsory teaching of the Holocaust in KS3. While it is of the utmost importance that these parts of history are learnt about, and in this case that the mass murder of millions of Gypsies and Roma people is included in that teaching, it should not be the only thing that is taught about these groups. Avoid stereotyping. Teaching about the culture of an ethnic group means walking a fine line between highlighting group traditions, while avoiding making out that everyone in that group does or is those things. As stereotyping fuels further prejudice, children and young people should always be pushed to recognise the groups’ heterogeneity. Think about the GRT pupils in your class. You might think you don’t have any but given that there are at least half a million GRT people in the UK, a large proportion of whom are under 18, and 75% of whom don’t declare their ethnicity, it’s very possible that you do but don’t know it. If you do know you have GRT pupils, you might want to let them know beforehand and perhaps ask if they have any thoughts on your plans or want to share anything themselves. They and their families might even want to get involved in helping you plan though you should also stress that there is no pressure on them to represent their entire community or culture. Co-authors Richard O’Neill and Katharine Quarmby wrote Yokki and the Parno Gry and Ossiri and the Bala Mengro in the hope that positive representation of GRT characters can help change attitudes. Find out more here and buy them here. The Spring Lane Traveller women’s group in Cork have also written a book called ‘Paddy the Traveller boy’. 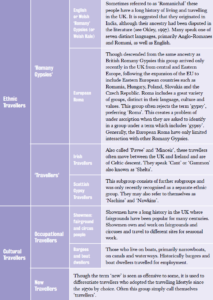 The Travellers Times has also provided a free downloadable songbook of Gypsy, Roma and Traveller music which also includes a brief summary of the contributions to music made by these groups throughout history. They’ve also teamed up with Twinkl to create a pack of resources for schools including a book about bullying and discrimination. 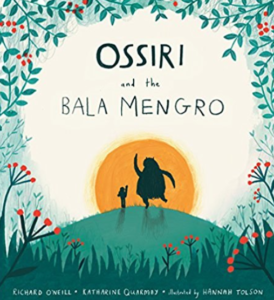 If you work with older children you might want to plan a full lesson for GRT history month (though I think Ossiri and Bala Mengro looks so incredible I’d read it to all ages!). (Pew Research Centre, 2014; Valentine and McDonald, 2004). Beyond teaching about GRT culture, it is therefore important to address underlying prejudice. Amanda Williams, a Psychology and Education lecturer at the University of Bristol and expert in how prejudice develops in children suggests a ‘perspective taking exercise’ as one way of tackling this. Perspective taking is the process of perceiving a situation or experience from a different point of view to your own. It can be ‘perceptual’: appreciating another’s sensory experience or ‘conceptual’: appreciating another person’s point of view or psychological experience. Perspective taking has been linked to our ability to empathise. Give pupils a scenario about Gypsies, Roma or Travellers, such as this scenario on the negotiation between a council and a community of Gypsy and Traveller families to provide available stopping sites. Pupils could then discuss or write about the perspectives of different groups involved in the negotiation. Use this lesson plan developed by Amnesty International to organise a class debate between ‘a group of travellers’, the local council and other interested groups. Be sure to encourage all pupils to reflect on the perspective of the Travellers trying to organise a safe place to live. To ensure that pupils can make the most of such activities and avoid propagating stereotypes about the lifestyles of GRT groups, you should first ensure that pupils have enough knowledge and understanding to have informed opinions. Conversations which tackle prejudice also rely on strong, trusting relationships to make them productive rather than damaging. Such exercises may not be suitable for all classes and are probably best suited to classes where pupils have been able to challenge commonly held prejudices and therefore have open minds. In preparation for the debate, or as an alternative activity, you can find out more about GRT groups and the discrimination they face or have pupils research themselves here, here and here. Remember to draw pupils’ attention to the fact that not all GRT individuals have the same experiences and consider how GRT pupils in your class might feel about the information and resources. I’ve found that Gypsy, Roma and Traveller people including those in the twitter sphere are more than happy to help out, make suggestions or support you to make a difference so reach out to them and make it clear that you want to make GRT history month a success in your school. @GypsyTravellers, @TravellerTimes @GypsyTravellerM and @LondonGypsyTrav are great places to start building your network. Finally, it’s important to acknowledge that having a single celebratory month does not negate the need to tackle prejudice, stereotyping and bullying at all times or to include GRT history and culture, or that of any other group, throughout the whole curriculum. Some critics in the US have suggested that Black History Month has too often ‘become a ready-made excuse to ignore African American history and contributions for the other eleven months of the year’. Nevertheless, GRT history month provides a brilliant opportunity for schools to review how inclusive their curriculum is and make a good start at including and celebrating Gypsy, Roma and Traveller communities.